Last week I mentioned a great giveaway that I've got coming up, courtesy of Bush Brothers. The gift package is very nice, indeed. 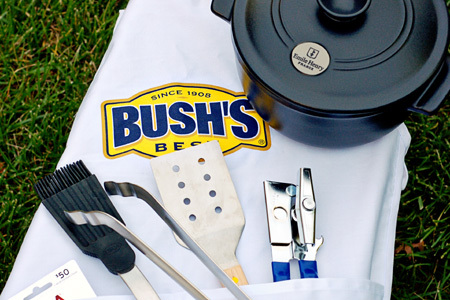 The package includes a French ceramic Dutch oven from Emile Henry, tongs and a multi-purpose basting brush from Rösle, an apron, spatula and can opener from Bush's, and a $50 Visa® gift card. I will be posting all of the recipes and some photos of the event early next week when I officially kick-off the giveaway. Grilled Strawberry Shortcake? I will definitely have to check back. That menu sounds great, what time and where? Jeff - The grilled shortcake is really easy, you'll see. ;-) The cookout will be held in a local park here in Boise tomorrow evening. John, I didn't really think you would answer the location question, I was just being a smart-aleck. So is this something you do for your Pastor? A whole church thing? Jeff - Yep, it's just a small way of showing my appreciation for all our pastors and their families do in sacrificial service. Grilled Strawberry Shortcake? Be still my heart! Just discovered your blog...kind of sorry I did as I have drooled all over myself! The Grilled Shortcake definitely caught my attention...can't wait to see the recipes!! Enjoy!! It all sounds good to me. Especially that steak sampler and the Bush's Ranchero Beans.